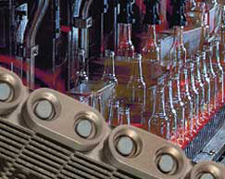 Ramsey has supplied glass conveying chain to bottle producers and glass equipment manufacturer’s for almost 50 years. Today, we offer the widest range of production proven silent conveying chains of any company in the world. From hot end, to cold end, to inspection applications, traditional Ramsey silent chains can be found in production plants throughout the world. Many conveying customers prefer chains that are designed to reduce maintenance and increase life by reducing some types of chain wear. Lifeguard(Patented), Allguard FX, Sentry, and R-Select(Patented) are conveying chains that offer extra wear protection for reducing pin head wear, link tip wear, and chain elongation. Connecting and disconnecting chains can be greatly simplified with the right tools. Ramsey’s patented RKO tool is equipped with modular guide plates which allow the tool to be adapted to almost any Allguard or Lifeguard chain. Our unique drive pin connection method and custom backup blocks further simplify chain connections in the field. Working with Glass Industry engineers, Ramsey has developed a new solution that greatly extends the life of take out arm drives. 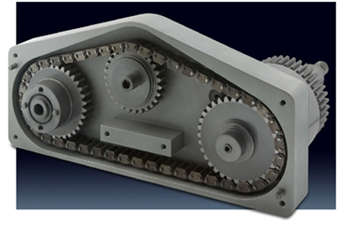 Utilizing high performance RPV silent chain in place of elastomeric belts, Ramsey take out arm drives can provide more than 10 times the life of a typical belt drive. 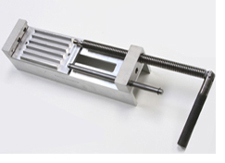 Available in kit form to retrofit most existing take out arms or as a complete assembly.